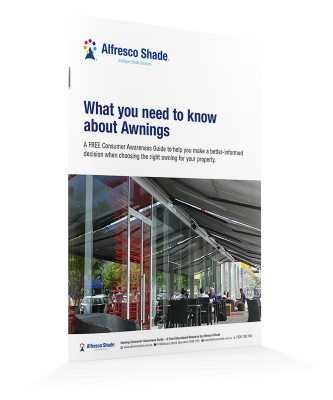 A FREE Consumer Awareness Guide to help you make an informed decision choosing the right awning for your property. 7 surprising ways a permanent awning can help your business. 9 hidden advantages of fixed awnings. Design recommendations for best results. Unique benefits of folding arm awnings. Is manual or automatic closing best for me? Exciting benefits of a retractable roof system. Limitations of a retractable roof awning. Is it right for you?